In late summer 2011, a modern trench near the assumed location of the ancient port of Panormos caught the attention of a team of geologists working in the area. The ditch had been excavated some years ago to contain a modern drainage pipe but had never been re-filled. As a result of soil erosion, including the slow collapse of the trench walls, a significant concentration of pottery fragments (apparently dating to between the 7th and 6th centuries BC) and ash-dense soils were revealed along a stretch of around 20m. Archaeologists and museum specialists who inspected the surface finds confirmed that the site seemed very likely to represent the remnants of an ancient necropolis. In order to prevent continuing damage to this potentially important site and, if necessary, to protect the area from the possibility of modern building activities, a four-week season of rescue excavations was set in motion under the administrative direction of the Miletus Museum (Balat) in cooperation with archaeological experts from the German Archaeological Institute, Istanbul in September 2012 (see Excavations). Whilst the work was set up as a rescue excavation aimed to document the ancient graves, the project has had, from the beginning, a strong research agenda addressed with the application of a variety of scientific methods (see Methodology). The necropolis project aims to examine a number of historical issues, ranging from revealing the lifestyles and geographical origins of the individuals who were buried at the necropolis; recording and interpreting details of local/regional funerary practices; to improving our knowledge of trade and interaction during the early 1st millennium BC. How extensive are the remains of the necropolis and how do they relate to the supposed location of the ancient port of Panormos and the likely route of the ‘Sacred Way’ between Didyma-Branchidai and Miletus? How long and during what periods was the site used as a burial ground? What kinds of people were buried at this necropolis? Were they ‘local’ residents or ‘foreign’ pilgrims? Can we document trends in the causes of death, age of death or any dietary patterns? From where did the associated ceramics and other grave goods come from? How can we relate these materials to the human remains? Do the find-repertoires or burial customs show any evidence for the historically and archaeologically documented international nature of the sanctuary of Didyma-Branchidai during the Archaic period (600-500BC)? During September 2012 and in collaboration with the Miletus Museum excavations were carried out at the area identified as a likely necropolis for the ancient harbour of Didyma, ‘Panormos’. 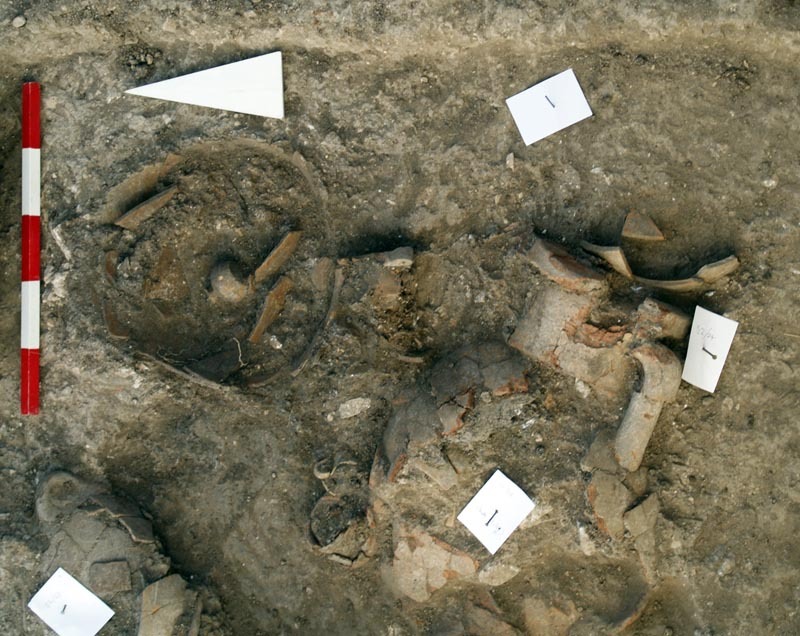 Two further seasons of excavations at the necropolis were carried out in 2013 and 2014. A number of provisional but important observations can be made about this Panormos. There appears to have been no uniform funerary tradition: uncovered were both inhumations and cremations, either directly in the ground or in vessels (especially pithoi, amphorae and hydriai). On occasion one or more miniature vessels accompanied the grave. Low quality wares such as ‘cooking pots’ were also common occurances. A provisional study of the ceramics indicates a period of occupancy from the middle of the 7th until the late 6th century BC. In addition to locally produced vessels, there are many imports from Etruria, Corinth, Athens, as well as Egypt and Cyprus. Planned anthropological and isotope analysis should reveal details about the (geographical) origin of the dead, their age, gender and health status. These data regarding the composition of the buried population will be particularly interesting given the context of the necropolis, namely in the immediate vicinity of a port which served the internationally famed and frequented oracle sanctuary at Didyma, and the diverse sources of ceramic material so far processed. The publication of the necropolis results are currently in preparation. A. Slawisch, 2018. Project Panormos: Necropolis Excavations; 23 Apr 2018. <http://www.panormos.de/pp/excavations/> accessed 22 Apr 2019.